Dynamics 365 for Marketing uses contact records to represent prospective customers and enables marketers to engage with those contacts through initiatives such as customer journeys, events, and landing pages. When a contact submits a lading page, Marketing typically auto-creates a lead for that contact, and marketers can manually add leads for contacts at any time. Dynamics 365 for Marketing then nurtures and scores those leads through a qualification process, and hands off marketing-qualified leads to salespeople for further qualification into opportunities. In this way, Marketing uses contacts to represent people and leads to represent specific expressions of interest made by those people. You can read more about this process in Manage customer information and The lead lifecycle. Dynamics 365 is a highly flexible and customizable system, where each organization can decide how to make use of the various types of records it contains. Some organizations may prefer, or already have in place, a more sales-driven process, where salespeople save new potential customers as lead records and only create a contact record based on a lead once that lead made a purchase or entered into an ongoing business relationship with the organization. So, does that mean you can't market to leads using Dynamics 365 for Marketing—of course not! Build marketing segments by querying lead records. Automatically generate contact records based on "orphaned" lead records and associate the two. Make marketing contacts easy to tell apart from sales contacts so you can set up custom views that show the right contacts to the right people. By conceptualizing leads as expression of interest, you can ensure that they are first qualified from a marketing perspective, and then from a sales perspective. When a salesperson enters a lead, the system assumes that the sales team has already taken over the responsibility to engage with that lead, just as they would with an already marketing-qualified lead. You maintain a clean database that includes both qualified and non-qualified contacts while avoiding duplicates and ghost records. You can see a complete 360° view of each contact's engagements and touch points, including for contacts that have several associated leads tracking their interests in various products and campaigns. 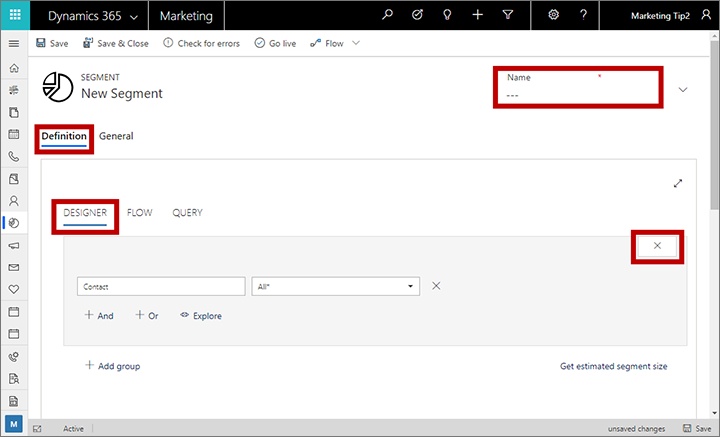 Dynamics 365 for Marketing lets you create segments based on queries against your customer database and then use those segments to target your customer journeys. The resulting segments must contain only contact records, but you can still set up query logic that starts by finding leads based on lead-record values and then populates the segment with the associated contact records. Select the close button to remove the default contact group from the Designer area. Many of your segments will probably start and end with the contact entity, but for this example we will start with lead instead. Set up a query to find the leads you need. In this example, we'll look for leads collected at a recent conference; all were assigned a Topic of "Contoso Ltd Conference". All segments must end by making a connection to the contact entity, so choose + And to add a new clause to your expression and set it to Lead -> Contact (Parent Contact for lead), which links from the lead record to the related contact record based on the lead's parent contact ID. Leave it set it to match All*. Select +And to add a final clause to the group, which must end with the contact entity. Set the new clause to use the Contact entity and leave it set it to match All* to find all contacts associated with the selected leads. Your segment is now live and will now find contacts associated with leads that have the specified topic. Segments, customer journeys, and other Dynamics 365 for Marketing features require that each lead has a contact associated with it. However, sales-driven setups may follow a different model, where leads are created as the first touchpoint, without necessarily having contact records associated with them. To solve this, you can use Dynamics 365 custom workflows to automatically generate and link a contact record for each new or existing unmatched lead record. To create the link, populate the parentcontactid field of each lead record with the GUID of the relevant contact record (this field is labelled as Parent contact for lead when you're designing a workflow in the UI). This field connects to the contact record through an N:1 relation called lead_parent_contact. For more information about workflows, start with the Workflows overview. Also, any user can manually select or create a contact for a lead by using the Inquiry stage of the Lead to opportunity marketing sales process business process on the lead record. Use the marketingonly flag on the contact entity to differentiate the automatically generated (marketing-only) contacts from other types of contacts. This makes it easy to tell these two types of contacts apart and to set up list views for salespeople that only show sales-qualified contacts without including the marketing-only contacts. If you are using a workflow to generate marketing-only contacts automatically, then your workflow should also set the marketingonly flag for the contacts it creates. Once the lead is qualified as an opportunity, another workflow could clear this flag from the related contact entity, thereby marking it as a sales-qualified contact. Marketing pages can create new leads when a known contact submits the page and no matching lead is found for that contact. To keep from generating duplicate leads, you should set the lead-matching strategy used by your landing pages to make sure existing leads will be found and scored when appropriate instead of creating new ones. For more information about how to set up your lead-matching strategy, see Configure landing pages. An initial contact-creation workflow that is inactive by default, but which you can activate and customize as needed to support your in-house processes. Contact list views that are preconfigured to show or hide marketing-only contacts for various audiences as needed (for example, a marketing view that shows all contacts, and a sales view that hides marketing-only contacts). A built-in feature that creates and associates contacts when you import large numbers of leads at once. Going forward, we will continue to gather market feedback to identify solutions for business scenarios that still are not supported by this marketing model.